An installation featuring 206 lightbulbs delineates a world darkened by conflict, country by country. How do you measure the state of peace in the world? With statistics? With models and figures? A new sculpture tries — with light bulbs. “The Future” is composed of 206 individual light bulbs — each bulb representing a sovereign state — that collectively spell out the word “FUTURE.” If the state is in peace, the bulb is on. If the state is in conflict, the bulb is off. Artist Alicia Eggert and graphic designer Safwat Saleem conceived of and built the installation for display at TED2015 in Vancouver, Canada. At the conference, Eggert told us about the origins of the piece and the conversation she hopes it inspires. How does “The Future” work? Each light bulb represents a different country, the bulbs turned on or off depending on whether or not each individual country is in conflict or at peace. The base of each light bulb has been laser-engraved with the name of the sovereign state it represents. All the light bulbs are wired in, and it’s just about turning the light bulb a little bit more into the socket to get it to switch on. Safwat and I are aware that peace isn’t binary — it isn’t an on-off thing. There’s a continuum and spectrum of peace to conflict. But if a country’s in conflict, the light bulb will be off. Only the lights of countries at peace will be on. Right now, the future, literally, will be kind of grim and dark. Only 33 of the 206 bulbs are currently lit. But we hope that illuminating the overall state of peace around the world in this way will spark conversation and debate and awareness. And we hope people see the big picture: how conflict happening in some really faraway places affects everyone, billions of people around the world. We might not feel it here, but hopefully this will show how it is affecting us. How did you and Safwat end up determining what conflict is? Our very first challenge was actually to determine the number of countries in the world, which would dictate the total number of light bulbs we would use to create the word “FUTURE.” In the end, we decided to be as inclusive as we possibly could by representing all 206 sovereign states. This number includes some states that are not officially recognized by the United Nations. 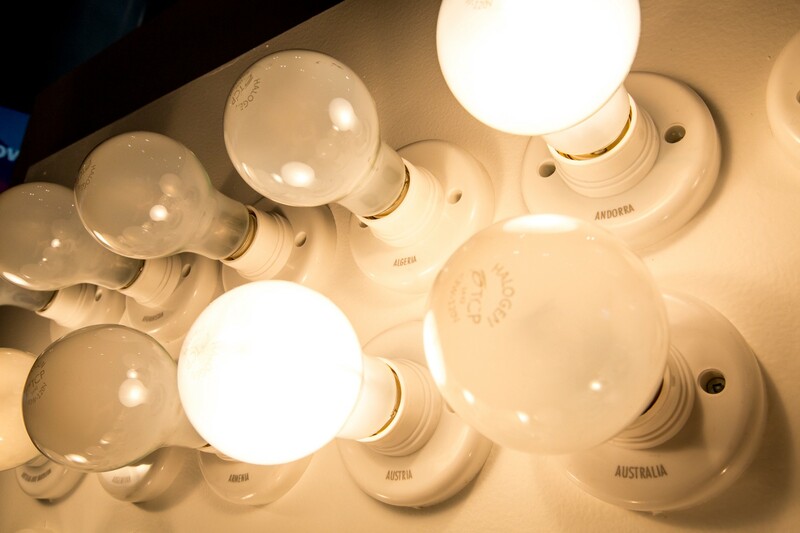 Our next challenge was to decide the on/off state of each of those 206 bulbs. One of our prompts was a link to an article in The Independent that talked about the Institute for Economics and Peace, an organization that releases a study every year about the state of peace or conflict around the world. This article claimed that only 11 countries in the world were free from conflict in 2014. But the IEP’s report was several months old, and it only addressed 162 countries, not all 206 sovereign states. So in addition to using data from the IEP, we also consulted websites like warsinthetorld.com and Amnesty International’s 2014/2015 report on “The State of the World’s Human Rights.” Ultimately, we had to draw an arbitrary line in the sand to make a distinction between “peace” and “conflict.” For instance, the IEP’s report lists a numerical score for various criteria, such as perceived criminality in society, political instability, violent demonstrations and homicides. We often used those scores to make our decisions. Safwat and I did independent research, defined our own parameters, and came to our own conclusions about each and every state. We did this intentionally to see whether there would be any countries we didn’t agree upon. There ended up being only six countries that we did not come to the same conclusions about initially, but it was not difficult to find a compromise. 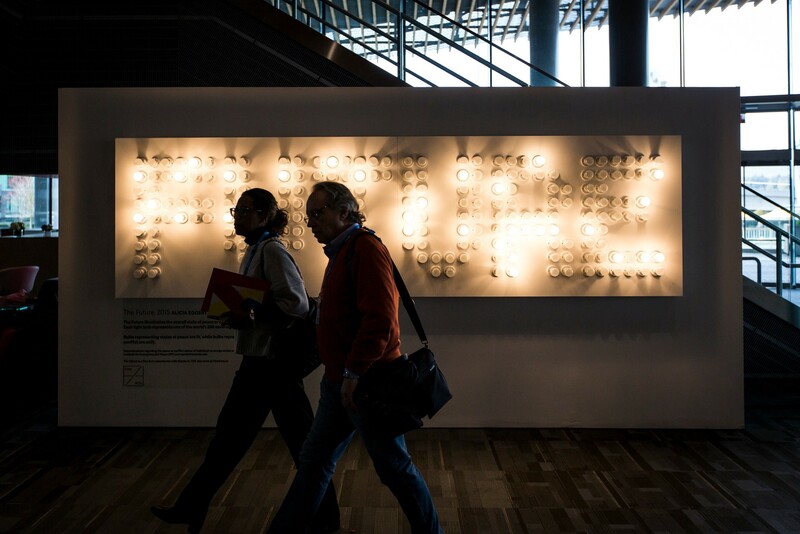 The Future on display at TED2015 in Vancouver, Canada. Photo: Mike Femia. How did you conceive of the piece? As soon as I had the idea, the next question was, “What does peace even mean, and how do I determine the number of countries in the world?” It has raised all these issues that I’d never considered before. I reached out to the TED Fellows community, asking, “Does anyone have thoughts about this, or want to weigh in?” Safwat Saleem started sending me his thoughts about how you might determine the number of countries or the state of peace. He was so helpful, I asked if he’d want to collaborate on it. He’s a designer, and I figured he would do a great job designing the typeface and all the other little things about the work. He said yes, and the piece evolved from there. For example, we decided to make the word “future” instead of “peace.” As you know, the theme of my artwork is time, and I’d wanted to do some kind of piece about the future for a while. Using the word “future” adds the dimension of time to the concept of peace — another layer of meaning. Can people look up the data behind the artwork, to get more detail and context? We’d like to create a website down the line and make that information available. What’s interesting is that I think different people would make different decisions about what constitutes peace. One of my dreams is to make this project available to people in other countries, so if an artist or an activist wanted to do their own version of “The Future,” they could determine their own number of countries, their parameters for determining levels of peace or conflict, as well as use their own language and typeface design. I would love to see many different versions of this being made. TED2015 attendees walk past “The Future.” Video: Mike Femia/TED. The TED Fellows program hand-picks young innovators from around the world to raise international awareness of their work and maximize their impact.